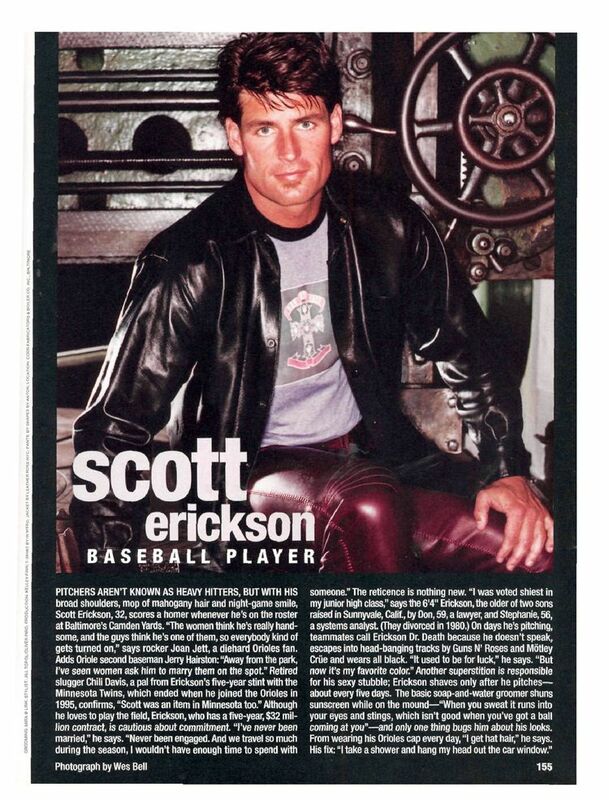 Originally drafted by the Mets on the 1,434th anniversary of the sacking of Rome, Scott Erickson decided to attend the University of Arizona in lieu of launching his professional career. It wasn’t until 1989 (the same draft that yielded the All-Powerful) when he decided to turn pro, signing with the Minnesota Twins. Erickson would win 61 games (and a World Series) for the Twins before being traded to the Baltimore Orioles, where he would go on to win another 79 games. All told, he accrued 23.4 rWAR (B-R.com) for those two clubs while being credited for starting the “longer pants no stirrups look“; not a bad run at all. His career clearly peaked prior to the 2000 season when he was included in People’s “Sexiest People” list. He only appeared in 16 games in 2000 and wound up sandwiching a disappointing 2002 season by missing the 2001 and 2003 seasons completely. And you thought Sports Illustrated cornered the market on magazine curses? Erickson had a cup of coffee with the Mets in 2004, winning a spot out of Spring Training before being sidelined by a hamstring injury. Erickson returned in July and appeared in two games, the first of which was actually a quality start. As you can see from the game log I linked, his second start was something of a disaster: he was pulled in the third after giving up four runs (he was ultimately charged with seven runs, bringing his ERA to an unsightly 7.88). I mention this disaster only to highlight a more significant Mets moment: David Wright hit his first major league home run in the top of the second. Erickson’s tenure with the Mets was over: he was traded to the Texas Rangers for a PTBNL that turned out to be Josh (no relation to Micah) Hoffpauir. It was an underwhelming stint, to be nice. But hey, he has nice hair. Fun Fact: Erickson is married to TV reporter/model Lisa Guerrero. UnFun Fact: Wikipedia notes that Erickson was charged with second-degree assault on his girlfriend in 2002, however, this story indicates that he didn’t initiate the incident. This entry was posted on February 4, 2011 at 10:47 AM	and is filed under David Wright, Flushing Frivolities, Mets. Tagged: David Wright, Flushing Frivolity, Josh Hoffpauir, Lisa Guerrero, Mets, Scott Erickson. You can follow any responses to this entry through the RSS 2.0 feed. You can leave a response, or trackback from your own site. Whenever Scott Erickson was on someone’s fantasy team, you were glad it was them and not you, although he did have a few respectable seasons. Extreme ground-ball pitcher. Carried himself like an ace, but was more of a #3 pitcher in most seasons. So who’s up next? Chris Bosio? Lol, maybe! This was actually meant to be #19 in my aborted countdown: I really wanted to run it because of his appearance on the “sexiest person” list, so here we are. I didn’t get much further, so I’ll have to dig around and see if I can find anything interesting about some other obscure Mets. Thanks for reading.